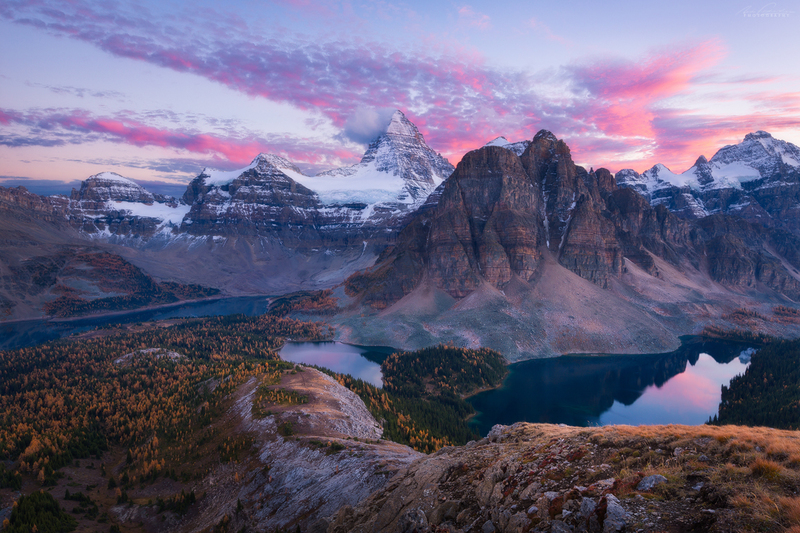 Mt Assiniboine Provincial Park, formed in 1922, and UNESCO World heritage listed as part of the Canadian Rocky Mountain Parks, is a true gem of The Canadian Rockies. 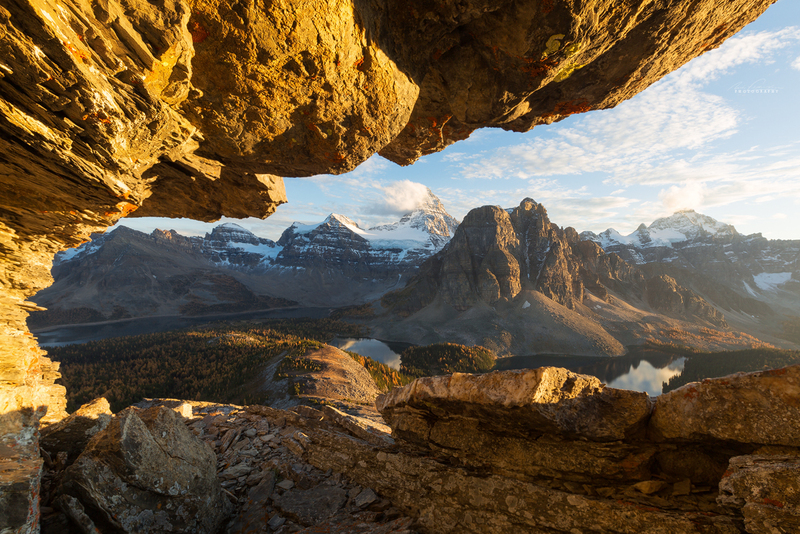 Photography opportunities at Mt Assiniboine abound with plenty of places to explore, to be creative, and to get up higher for an elevated view of the surroundings. The base elevation at Lake Magog where you can camp, stay in the Naiset Huts or at Mt Assiniboine Lodge is just above 2000 metres (6500 ft) above sea level but that’s just your starting point! 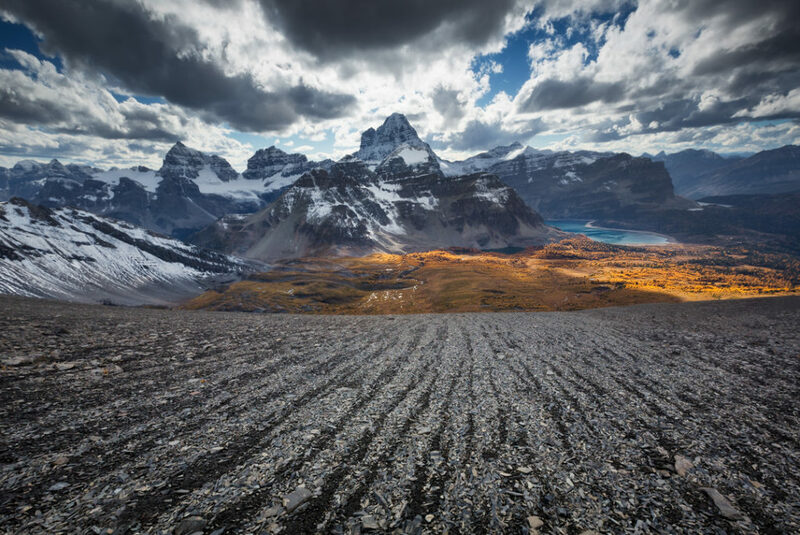 Read on for some ideas on how to truly explore the Mt Assiniboine area on foot by visiting its surrounding summits. The Towers, Wonder Peak, Mt Cautley, Windy Ridge, Og Mountain, Cave mountain, Sunburst Peak, the famous Nub Peak and its sub peaks (Nublet, Niblet….& The Nib!) 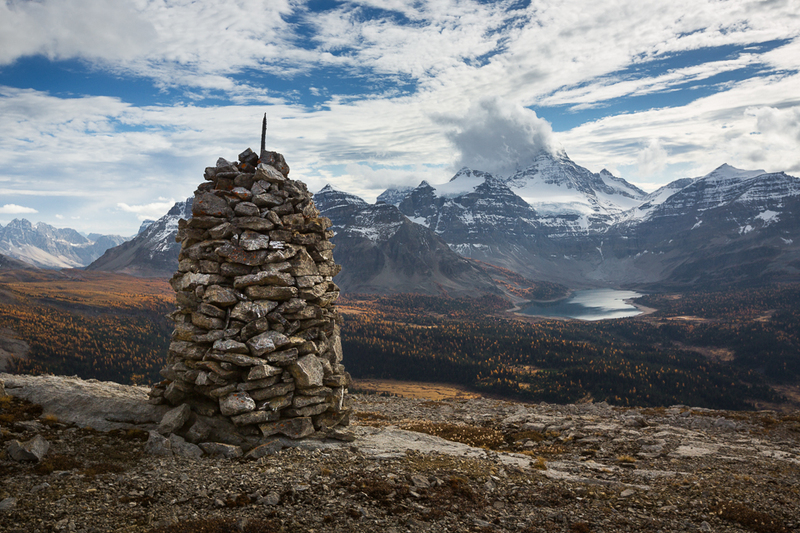 are just some of the off-trail viewpoints you can reach on a day hike from the core Mt Assiniboine area. Disclaimer: These summits can be dangerous places, some requiring off-trail route-finding, and possibly difficult scrambling to reach the top. In addition there is no quick way off if poor weather comes in quickly as can often be the case. I will give you an idea of what to expect, some tips, and some inspiration but these hikes can be serious and are to be undertaken at your own risk. Do not proceed without mountain based skills/experience, trip partners and equipment (helmet, map, and a satellite phone at a minimum are my recommendation). In many cases even going only part way through on these suggestions is equally rewarding, especially when photography is the main goal. I’ll outline the difficulty level of each trip, and offer a suggestion for minimizing risk while still gaining the reward of a unique view. 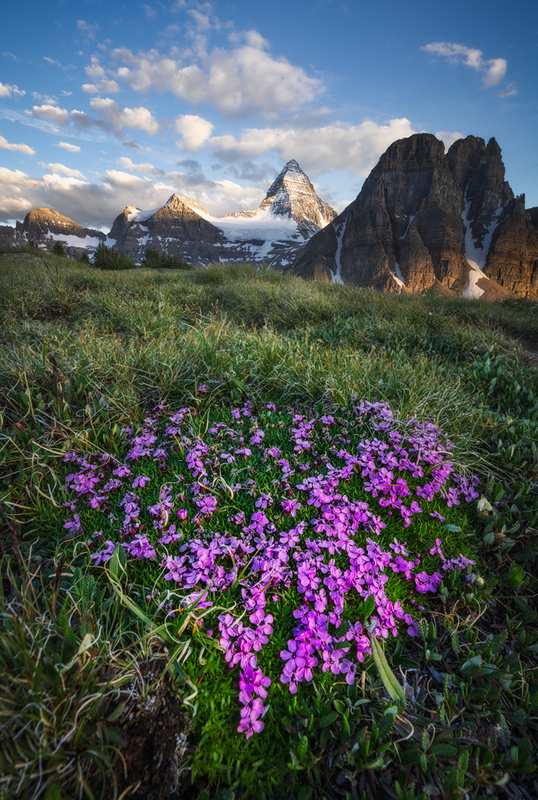 Consider hiring a guide to safely explore – I offer guided photography adventures in the Mt Assiniboine area every year! * Most of these options are beyond the scope of my guided trips though as I try to maximize your photography/learning time. It is my priority to seek out areas to safely wander while focusing on composition & lighting. 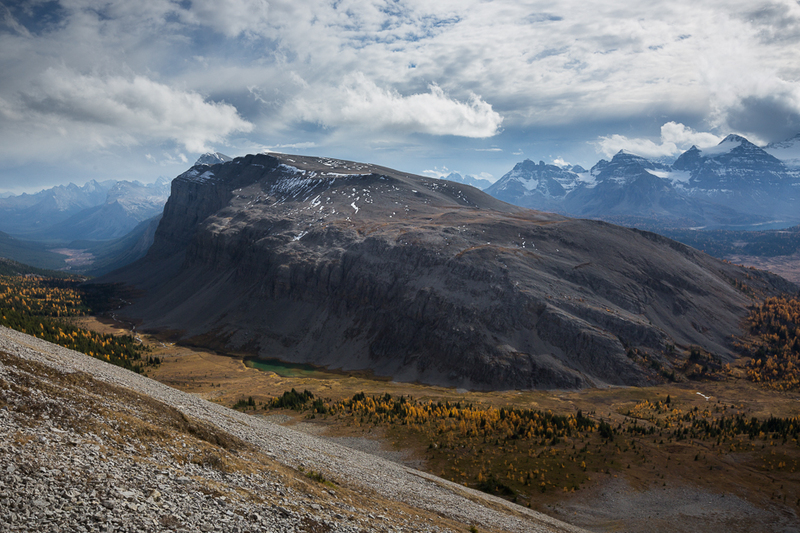 Best time for photography: Autumn – Fall colors all throughout Wonder Pass along the access trail. Morning, for nice unobstructed side lighting. Getting creative with the pillars and jumbled rock boulders is a lot of fun on this one. Description: The Towers stand 2846m (9337ft) high above Gog Lake. Head for Wonder Pass and cross over into Alberta dropping down off the pass still on trail. You will leave the trail on the right hand side very shortly after losing some elevation off the pass aiming past an obvious giant boulder on the slope for the shoulder of the Towers. 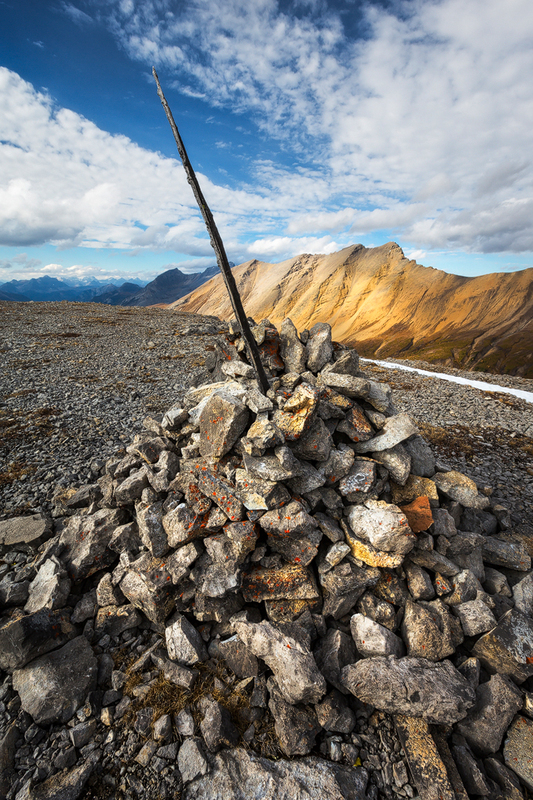 Find the easiest line which means crossing a boulder field and walking uphill away from the direction of The Towers for a ways to gain this shoulder/visible ridge and you should start to pick up a faint trail, cairns and flagging as you go – markers letting you know you are on the right route. 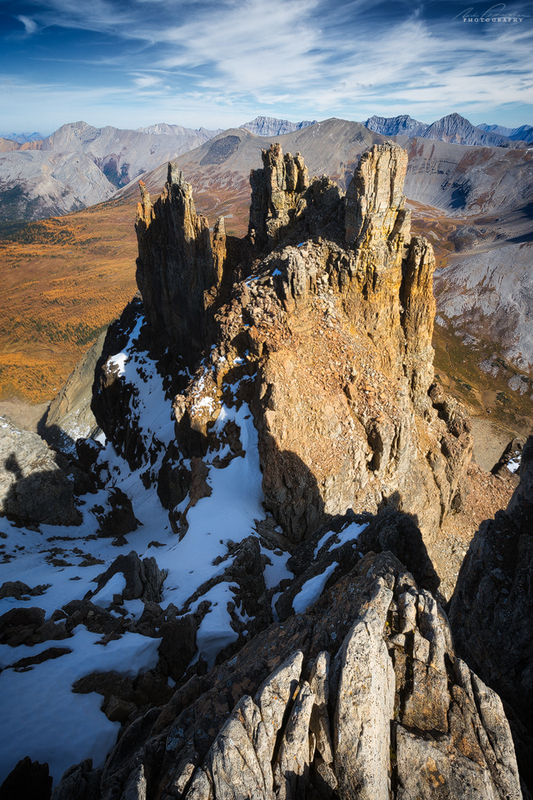 Once you gain the shoulder you will begin to turn towards the summit itself continuing to follow a faint trail beaten into the scree and rock, up through jumbled rock, and eventually to the exciting pillars that give the Towers their name. Be careful to follow the markers and beaten path otherwise this easy-to-moderate scramble (sometimes using hands for balance) can easily become a rock climb. The route looks improbable at times but that’s the beauty of this one, it’s really straight forward if you get the route finding right and you can enjoy a cheese platter on top with 360 degree views if you have a friend who brings those kind of things along! Alternative or abbreviated trip suggestions: Wonder Pass area or continue over Wonder Pass and out to Marvel Lake viewpoint. This is all on trail and avoids the more strenuous off trail hiking on loose rock up elevation gain. 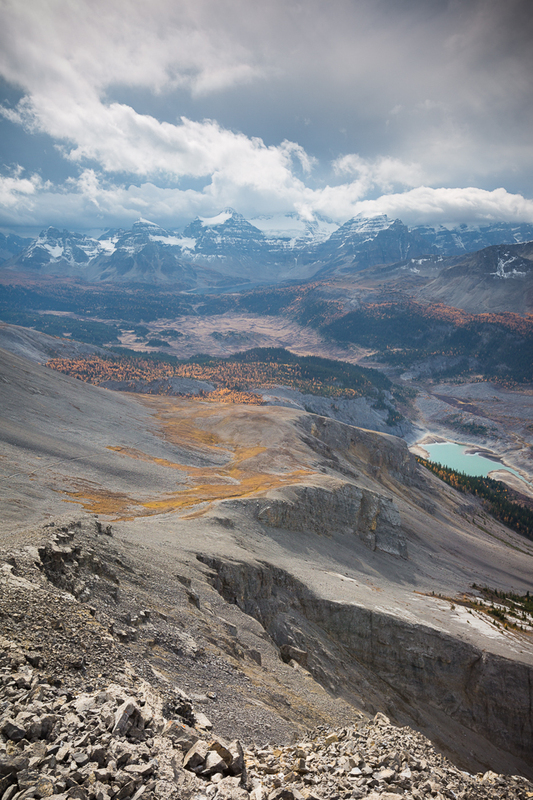 Best time for photography: Autumn – Fall colors all throughout Wonder Pass along the access trail. Back lighting the Assiniboine massif in the afternoon could be interesting but for any scramble I recommend to do it in the morning. Description: Wonder Peak stands 2852m (9357 ft) on the other side of Wonder Pass to The Towers. Reach Wonder Pass on trail and at the high point leave the trail and follow the ridge line all the way to the top to unofficially named “Little Wonder”. Once you reach this point the going gets harder as you traverse around the right hand side and then along the back of the peak skirting the more difficult stuff on climbers-right. It can be a bit loose, a bit exposed but there should be a faint trail along the way. You are walking along the continental divide separating British Columbia from Alberta! Once you reach the summit block traverse around it to the back (East side) and climb a short chimney to the top. This chimney is blocky but exposed, and the hardest section of the scramble. Alternative or abbreviated trip suggestions: Wonder Pass area or climb part ways up the slope towards Wonder Peak to some elevated bench like areas along the route and this will open up your view significantly improving upon what you see at the pass. If you reach the top of this ridge you’ve made it to “Little Wonder”, a really great easier option. It becomes more difficult from that point on to reach the true summit. An extension of Wonder Peak is the Wonder-Cautley horseshoe, or traverse. You could do it in either direction. You get an extra summit without losing too much elevation gain but it adds time and distance to your day. This extension grades the trip into the Hard realm. The grading increase comes from one section where you must find your way down off Wonder Peak safely. There is a gully that is loose and steep on the LEFT (British Columbia side) that you must find as you near the end of the Wonder Peak massif. It allows you to descend down and then skirt beneath the big end buttress. Don’t try to continue right along the spine as it will dead end in what looks like an almost possible steep gully with a chock stone in it. Out of sight things get too tricky and exposed that way. You will probably reach this point – just make your way back until you find the correct descent gully nearby. Don’t attempt it with snow. Helmet essential! This viewpoint gives you great views of Marvel Lake, and Lakes Gloria & Terrapin. It is a great spot for photography and offers a more laid back alternative to either the Towers or Wonder Peak. It is all on-trail to get there too. First cross Wonder Pass into Alberta, dropping down the other side and watching for a sign indicating the fork in the trail some ways ahead. Take the left fork and head back uphill towards the viewpoint. When you arrive you might need to explore around ahead further for the best viewpoint of the lakes as some of the terrain can obscure it. It is 11km round trip from the Lake Magog Campground and about 300m elevation gain once you account for all the ups and downs. You will be walking through prime grizzly bear habitat all along the way, make noise and carry bear spray! Best time for photography: Summer or Autumn – golden larch trees throughout Cautley Meadows on the off-trail access route during fall and wildflowers during mid summer. Morning or late afternoon are both great in Cautley Meadows! Description: Mt Cautley stands 2880m (9449 ft). To approach it you have a couple of options – follow the Wonder Pass trail passing Gog Lake, and attain a meadow after a short section of uphill. Leave the trail here and head in a bee line directly for Mt Cautley. Alternatively at the Naiset Huts, walk over to the warden cabin and pick up faint trails near there to take you uphill into Cautley Meadows. In either case, as things open up you will be able to see ahead more clearly and approach the big easy scree slope up Mt Cautley. Be careful of this slope, it was the site of a rock slide in the past – you will see evidence of that towards the North end of the mountain – avoid that. Head straight up the scree aiming for the high point in the middle. It is a lot more fun to come down, especially nearer to the top where it is all finely eroded rock. Cascade Rock, Ely’s Dome, & Gibraltar Rock all signify viewpoints at the extremities of Mt Cautley. Alternative or abbreviated trip suggestions: Explore Cautley Meadows. There are little tarns and streams to be found which offer great reflections and foregrounds. Also going up slope part ways towards Mt Cautley before it turns to rock scree gives you an impressive vantage point of the entire alpine meadow system and a good idea on where you will want to go next! 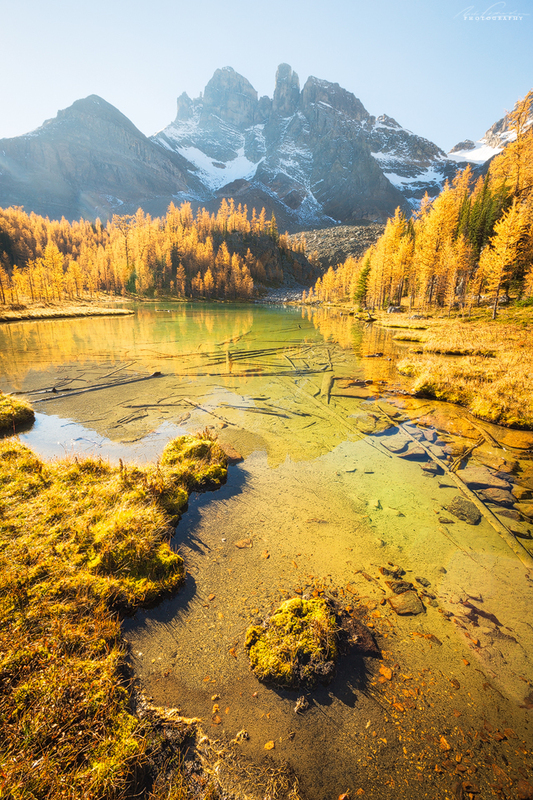 Best time for photography: Autumn for the golden larch trees along the way. Early morning or late afternoon light would be best. Watch out for grizzlies, make noise and carry bear spray – do not enter the Og Pass area along the side of this route if it is closed (it has a seasonal closure for grizzly bears). Bring a telephoto lens to still be able to shoot Mt Assiniboine from a distance! Description: Windy Ridge is actually a named high point standing 2635m (8645 ft) high. 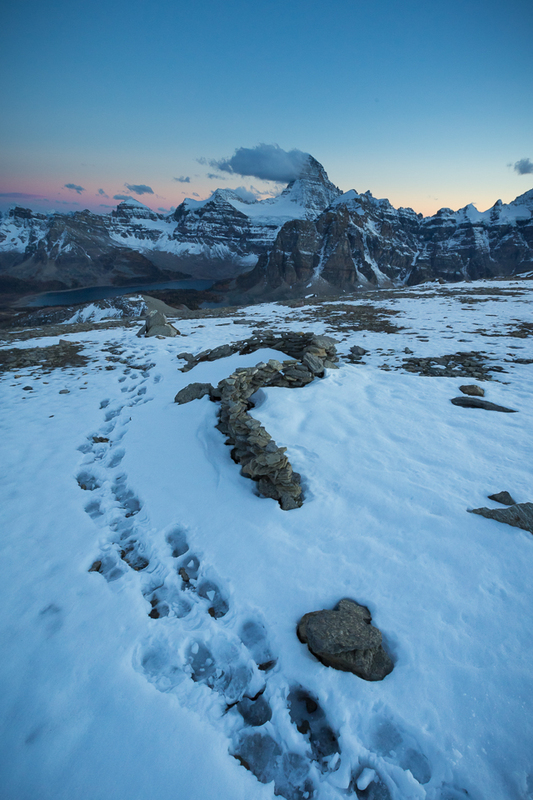 It is a longer trail that takes you away from Mt Assiniboine, departing from the Assiniboine lodge area. Follow signs to Windy Ridge which first heads North towards Og lake for a short ways before branching off, crossing meadows, through forest and finally breaking out above treeline into the alpine. It is less visited than other trails in the core area at Mt Assiniboine and the views are broad across the entire valley. Once you reach the end of the trail sign, follow the beaten path in the rock scree up to the col ahead. From there tackle Windy Ridge following the beaten path to the top. 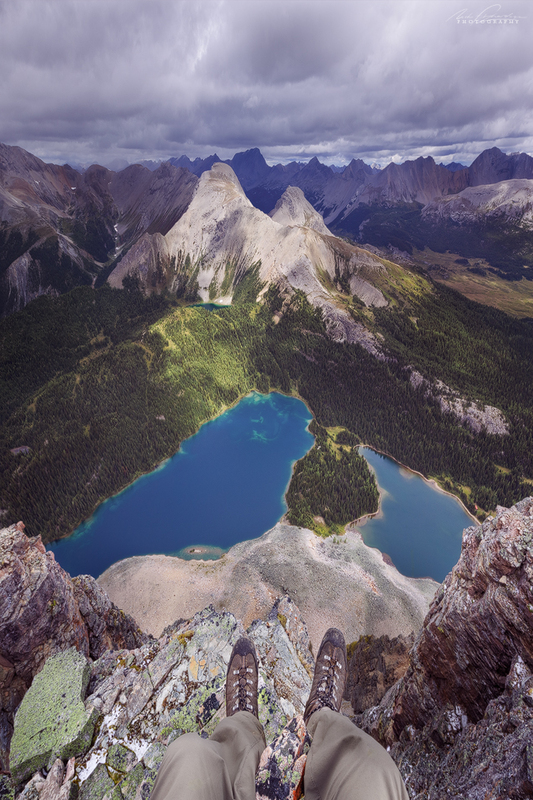 The final metres are slightly exposed and offer a dramatic view down the edge of a cliff spine. 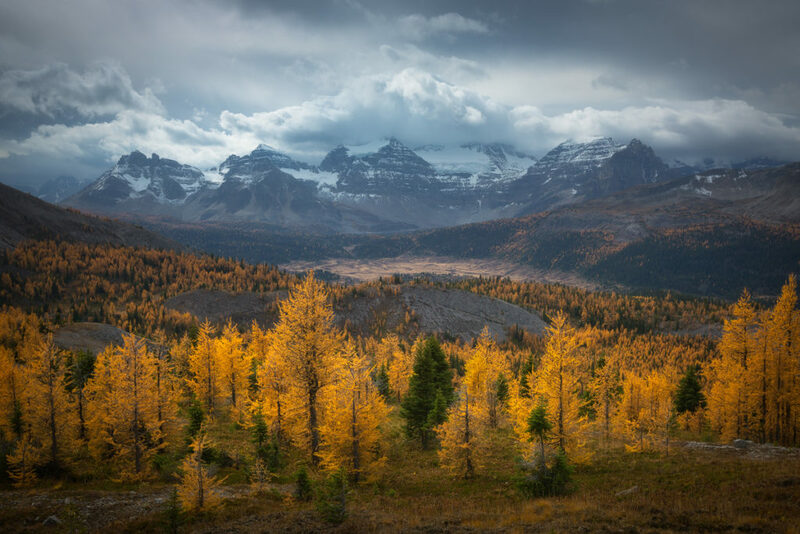 Alternative or abbreviated trip suggestions: Reaching the larch trees is a great reward especially in fall and I believe most of the best photos are in this area anyway. Also once you pass the end of the trail sign you can continue up until the col between Windy Ridge – Og Mountain #1 to look over the other side of the mountain. That col is also a worthy spot to stop with a rewarding view without the final push to the top. Best time for photography: Autumn for the golden larch trees along the Windy Ridge Trail. Morning light is great. Description: Og Mountain stands 2874m (9429 ft) high and has 4 bumps along its summit ridge line. The 4th and furthest of these is the high point. 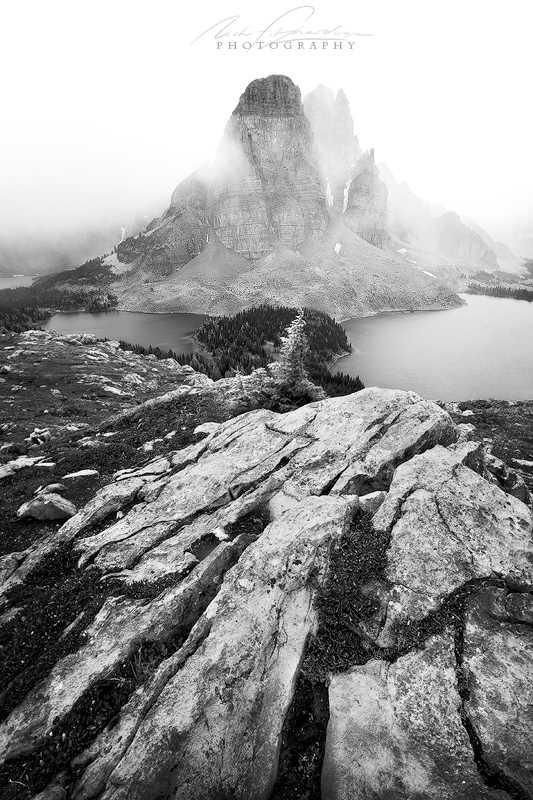 Start at Assiniboine lodge and follow the windy ridge trail. Once you almost reach the top of windy ridge (The col separating Windy Ridge from Og Mountain) turn right, uphill on loose rock and in 30 minutes without any technical difficulty reach the top of Peak 1 of the Og Mountain chain. Proceed carefully along the spine, down, up, down, up, down, up to the 4th summit. Generally it is moderate for this traverse but the drop from the 3rd summit down to the 3-4 col is challenging requiring a lot of care. Rock is loose and its steep. It’s best to attempt it dry and with a helmet. The view from the 4th peak is actually worth the traverse as you get an up close look at Mt Allenby and the view back towards the 3rd peak of Og is also pretty intimidatingly good. Return the way you came. I combined Windy Ridge with Og Mountain and Cave Mountain on this day so I chose the descent gully off the front between peaks 1-2 of Og Mountain to save some time. It looked the easiest of the gullies and it went by quite fast on the loose scree. Once out of the chute, I traversed back around to re-meet the Windy Ridge trail. Alternative or abbreviated trip suggestions: The larch trees are a great destination in themselves as is just the first summit of Og Mountain. Beyond it, it is more challenging. A summit cairn at this point as well as incorrect markings on maps label this as the true summit. Best time for photography: Summer. Early morning or late afternoon. Description: Cave Mountain stands 2651m (8697 ft) high and is a giant rounded mass that takes quite a lot of plodding across its vast expanse to reach the true summit. Take the Windy Ridge trail from Assiniboine lodge and once you start to break out of the forest (before you reach signage for Og Pass) head uphill (right) off trail making your own way up the easiest terrain possible ahead of you. Once you break through the initial cliff band its all low angled walking to the top which is way on the other end. In fog you could definitely get lost up here and the terrain is interestingly sunken in sections. 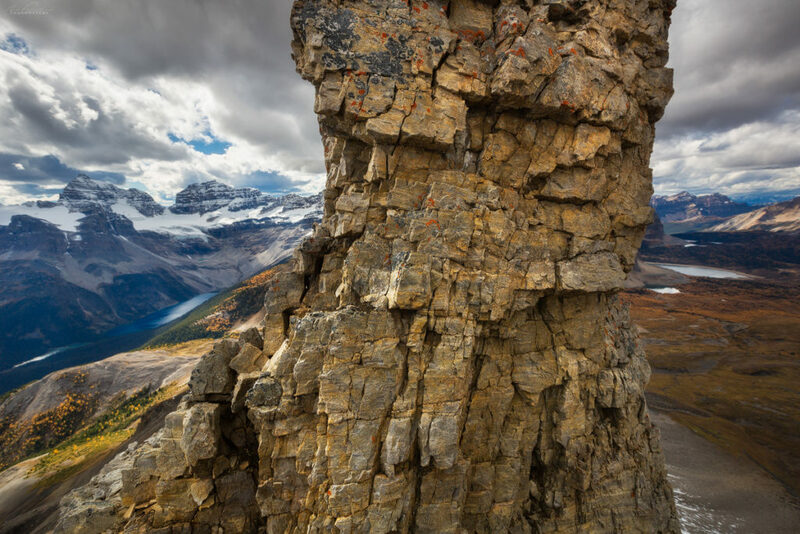 Cave Mountain gets its name for the caves seen on its Southern face viewed from the Assiniboine Pass area. There are some very big cairns built up there too, especially the one on the Southern end closest to Mt Assiniboine (pictured above). I chose to descend off the front side towards Assiniboine for hopefully a quicker descent. I wouldn’t recommend it, I ended up in a sea of cliff bands followed by dense forest until I gained the Assiniboine Pass trail back to the lodge. Not great for unexpected wildlife encounters. Just return the way you came. Alternative or abbreviated trip suggestions: The Windy Ridge trail continues into more dense sections of larch trees further on past the Og Pass turn off which are great to photograph in fall. That would mean you stayed on trail. Og Lake would be another option lower down in the valley floor and offers a bit of a moonscape with how dry and bouldery that area is. Best time for photography: Summer, under morning light. Description: Sunburst Peak stands 2830m (9285 ft) high right above the Lake Magog campground. The challenge in scrambling it is finding the correct route to the top and the accompanying exposure. There is one specific grassy traverse and a gully near the top that you should identify before setting out. Cairns will be there in places to help when you are on-route so keep an eye out for these. Start in the campground and head straight up, bushwhacking a bit first through the forest, then through a boulder field. Climb these boulders up onto a flatter bench and some grassy slopes above with ledges appear. Traverse a key ledge to the right and then switch back once off it to find the entrance to the final ascent gully. Follow this to the top and then triumphantly stroll out onto the end of the flat topped peak to look down at Sunburst and Cerulean Lakes. Watch out for mountain goats who absolutely love this mountain! Alternative or abbreviated trip suggestions: Follow the trail to the end of Lake Magog instead. Tons of wildflowers in summer especially Western Anemone and you almost get vertigo from being so close beneath Mt Assiniboine. 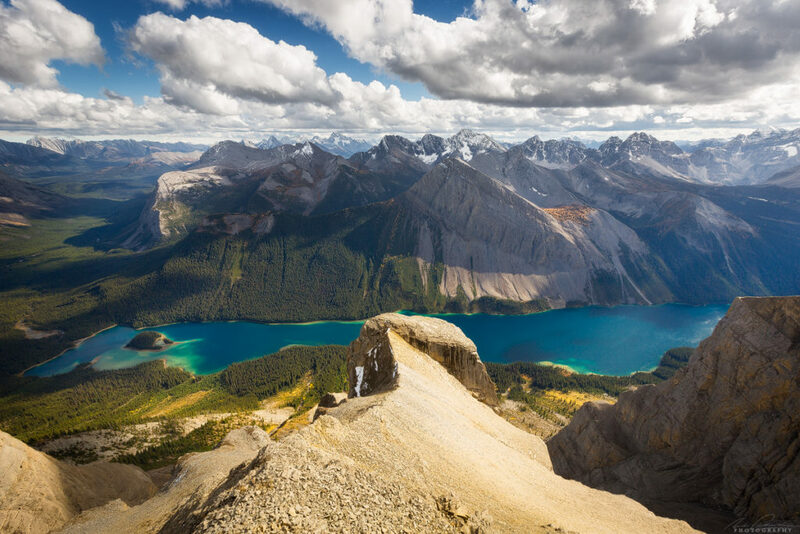 Nub Peak – is it worth it to go the extra yard to the true summit? Description: Nub Peak stands 2755m (9039 ft) high and has a few famously abbreviated viewpoints along its ridge-line below – The Niblet and The Nublet. If coming from Assiniboine lodge you have a couple of options, follow signs to Sunburst Lake (via the Lake Magog Campground), pass by it, and turn off at Cerulean Lake, following signs to Nub Peak. Otherwise follow a more direct path from the lodge through meadows and then uphill through forest where you break out of the trees for astonishing views at The Niblet. The trails connect here. Continue on up the ridge and the views keep unfolding as the perspective changes with elevation to the top of the Nublet. Some light easy scrambling begins at this point as you continue along a ridge and then up rock fields to Nub Peak. It is quite a bit further away and Mt Assiniboine appears to pierce higher into the sky from up here although its surrounding peaks meld into one and the overall depth is somewhat lessened. From a photography perspective, skip the extra hiking and stop at The Nublet view unless you want to tag the top or have extra time in your day. 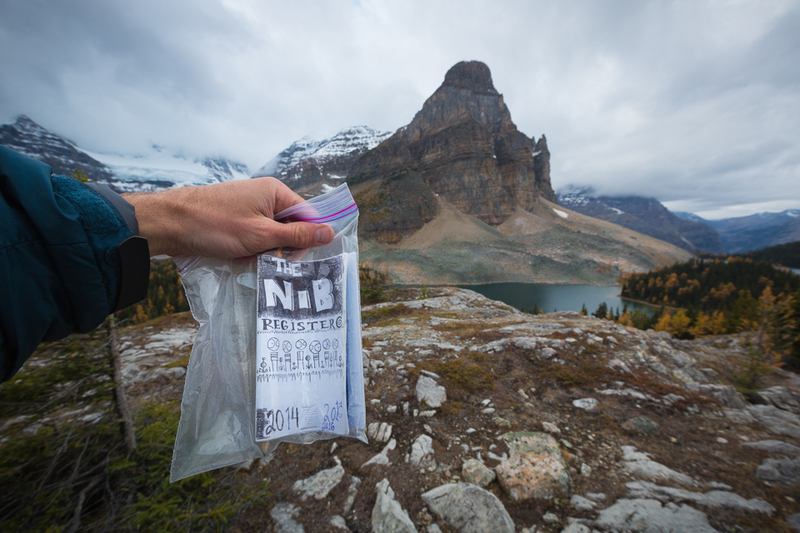 Alternative or abbreviated trip suggestions: Stopping at The Niblet or the Nublet viewpoints below is a great alternative to completing the full trek to Nub Peak. Most people do this! I would recommend the round trip loop including Sunburst and Cerulean Lakes in this outing. The Nib – a bonus secret viewpoint! So you thought you had seen them all! Descend off the Niblet a short ways directly towards Assiniboine lodge on trail. 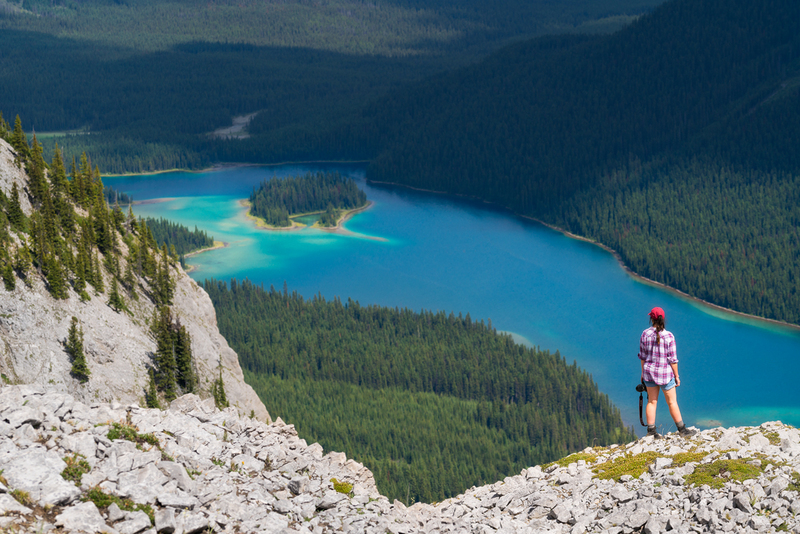 After a few hundred metres break into the forest and forge your way through until you reach a knoll directly above Sunburst Lake. Bushwhacking and route finding required! This would be a great spot to be for some good light as I haven’t seen a good shot from here yet. A new perspective! I descended directly towards Sunburst Lake from here and it is not something I would recommend – the scrambling and bushwhacking for what looks like it should be easy, is not. There was a bottle of jagermeister with the summit registero here but I wasn’t about to test the contents to see if it still was or not! 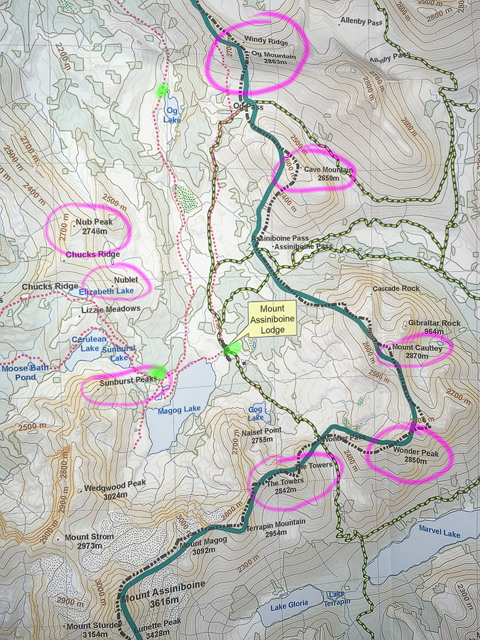 A map of the Mt Assiniboine core area with the summits circled in purple and the green dots representing your options for a nights rest. Contact me using the form below for more information or visit the photography workshops page to check to see if there is a trip currently available. All spots on all dates for 2019 are currently sold out. 2020 dates will be released in January.